Goji is the creation of Gotham Studios, a production company of veteran producers from Hollywood and New York. We've created countless productions for television, radio, websites, and events across the nation. Peter is an Emmy-winning TV producer with 3 decades at networks and shows including Today, National Geographic, E!, History Channel, Comedy Central and Pee-wee's Playhouse. He's a dad, a cappella singer, Broadway actor, software engineer, inventor, and Yale graduate. He married an Eastman composer who's now his patent attorney/wife (see below). Russ, a certified genius, built the GojiBox. President of Rajco Services, Russ is considered the industry's leading expert on in-flight entertainment, cabin management, conductivity, and airborne broadband. He's got 40 years in the aviation industry including the US Air Force, Douglas Aircraft, Matsushita (Panasonic) Avionics, Airshow, and Astronics Custom Control Concepts. Charles has been building digital products since the very early days of the web. With a unique combination of art and computer science backgrounds he's had the honor to work with exciting early stage startups as well as many of the Fortune 250 including Google, Disney, Microsoft, and Riot Games. After cutting his teeth in NYC, SF and LA he now spends his time in Austin, TX—mostly in the comfort of air conditioning. Stacy is probably who you'll meet first. With over two decades as a communicator and bizdev executive, she has consulted for the world's biggest brands, and traveled throughout Latin America, Asia and Africa with NASA and USAID to combat the effects of climate change. An accomplished actor, she recently appeared in a film opposite Eric Roberts (Julia Roberts' brother). Angel is a Silicon Valley big shot, managing the IP of many of the world's top tech companies in the areas of 3D graphics, image processing, game systems, virtual machines, business analytics, audio, and Web tech, to name a few. Her ongoing hobby is acquiring patents for Goji technology. In addition to her law degree, she has diplomas from Purdue in engineering, and from Eastman in music composition. Like the GojiBox, Goji is small and highly entertaining. Before coming to Gotham Studios, she worked for several dog-years at a multi-national law firm with offices on both coasts of the US. Skills include snuggling, begging for affection, dressing up for Halloween, and snoring. That's about to change, thanks to the GojiBox. What if every time you passed a place, you could hear a story about it? Surely, every place has a story to tell. Gotham Studios gives you the world in a box. Fly your bizjet from New York to Paris, and you might start the journey with a short documentary on Charles Lindbergh and finish with a presentation on which wine should accompany escargot. 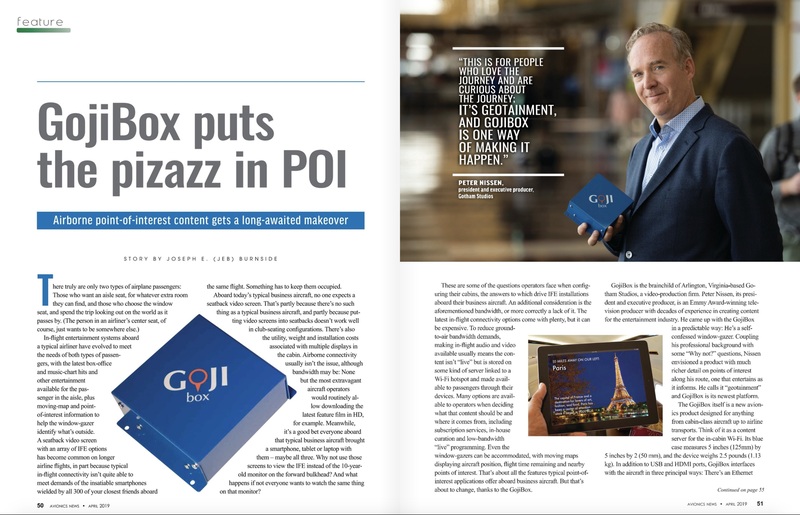 The fully integrated GojiBox IFE system taps the aircraft's navigation data to deliver location-specific content. The trend today is the passengers want their entertainment on their own devices, and we cater to that. Interested in Goji for your aircraft? © 2019 Gotham Studios, Inc. GojiBox® is a registered trademark of Gotham Studios, Inc.